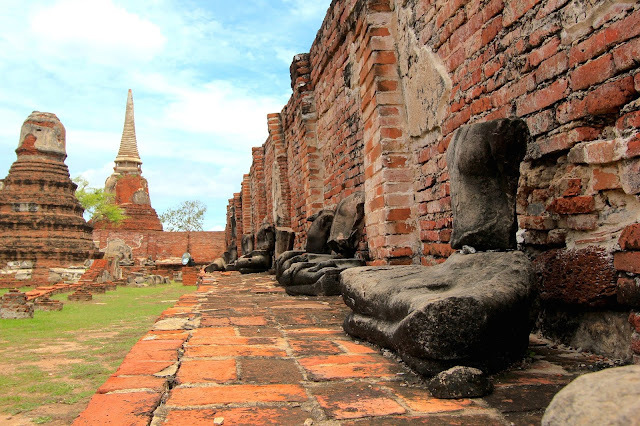 While staying in Bangkok I could not miss out on a trip to Ayutthaya, an incredible complex part of the UNESCO World Heritage Centre. 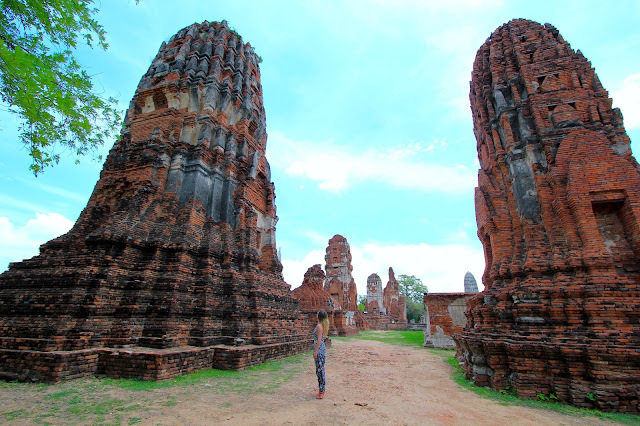 Before I left Aberdeen, a few people had mention Ayutthaya to me and recommended it, so it made its way to my list of things to do straight away. After around an hour or so in a mini bus, I finally arrived! Wat Phu Khao Thong is worth the climb to the top, so you see the scenery around from a higher than usual point of view. Half an hour later and the group moved on to the next historical destination. 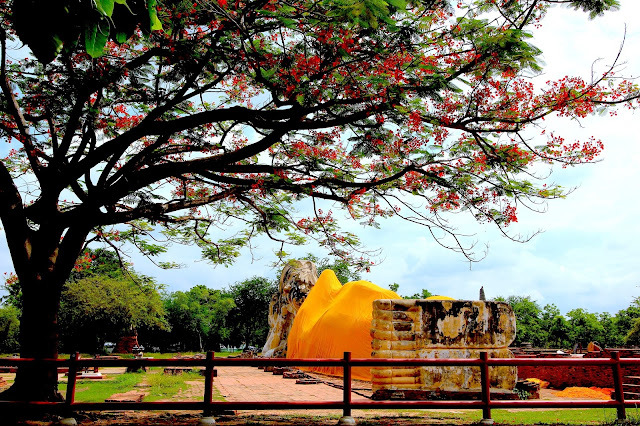 This beautiful place has many stupas, where relics are placed, as well as beheaded Buddha's monuments without arms. 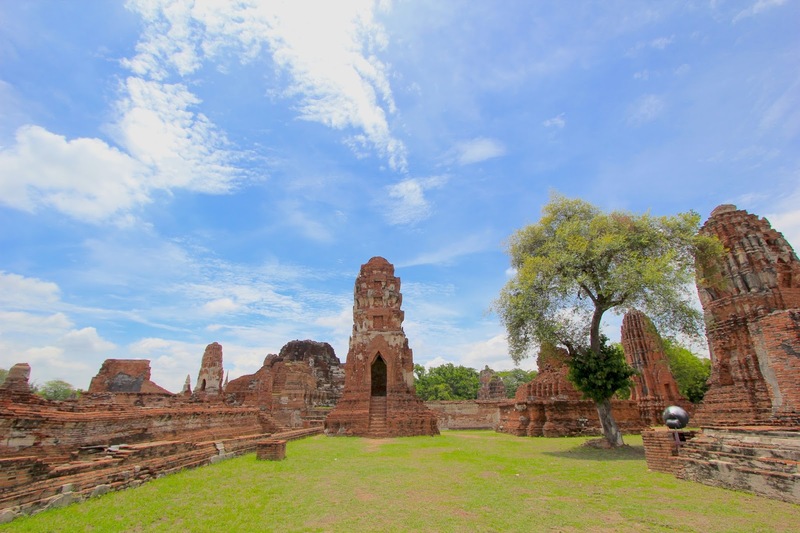 A few centuries ago Ayutthaya was a kingdom and a place of war. 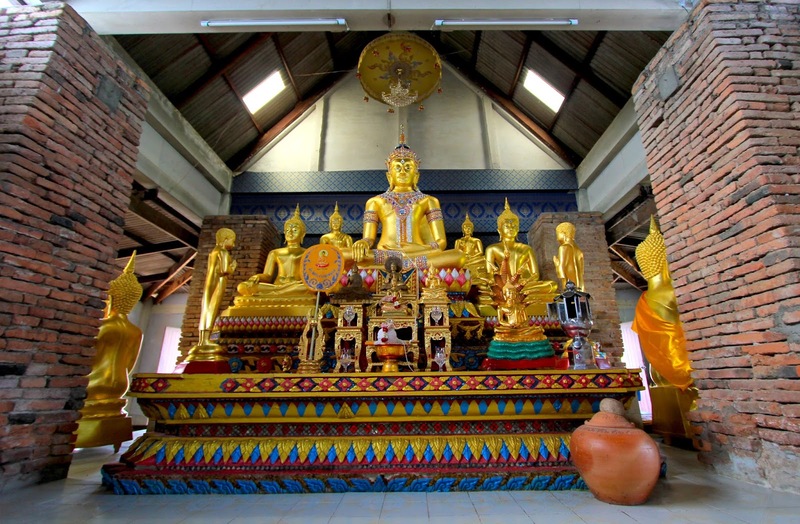 Precious gold and gems was hidden inside the statues as a tribe to Buddha. When the complex was besieged the attacker destroyed the statues, removing the heads and arms, in attempt to steal the gold. If you look at the statue from above you will have a chance to see where the gold was placed. 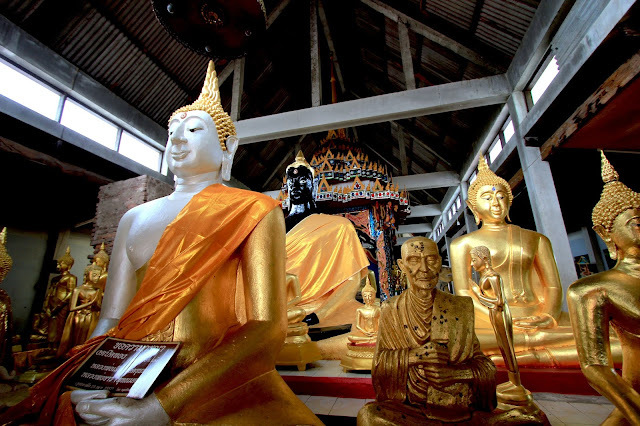 Some of the statues I checked had an empty space, perfect to hide something inside. 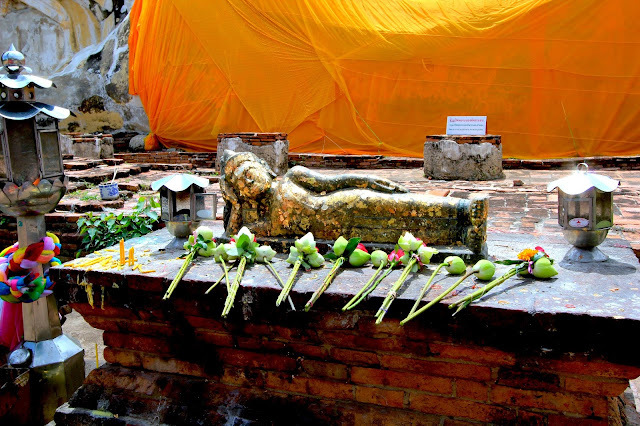 Sleeping Buddha, Wat Yai Chai Mongkhon is a really interesting place to wander around and take in the atmosphere. 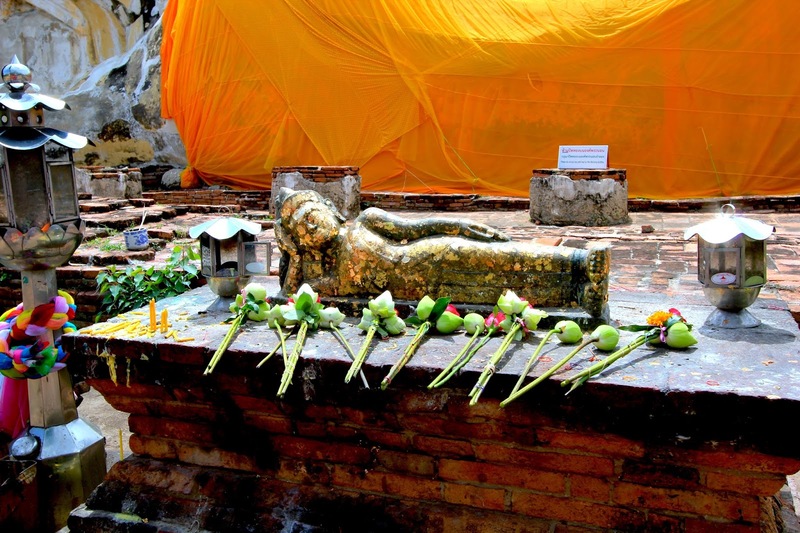 One of the things I was not impressed with was how pushy sellers were in this location, they were trying to force you to buy flowers for Buddha. These flowers were picked up and resold over and over again to the next person as soon as you left. How do I know? My group stayed there for a while so I had a chance to watch. 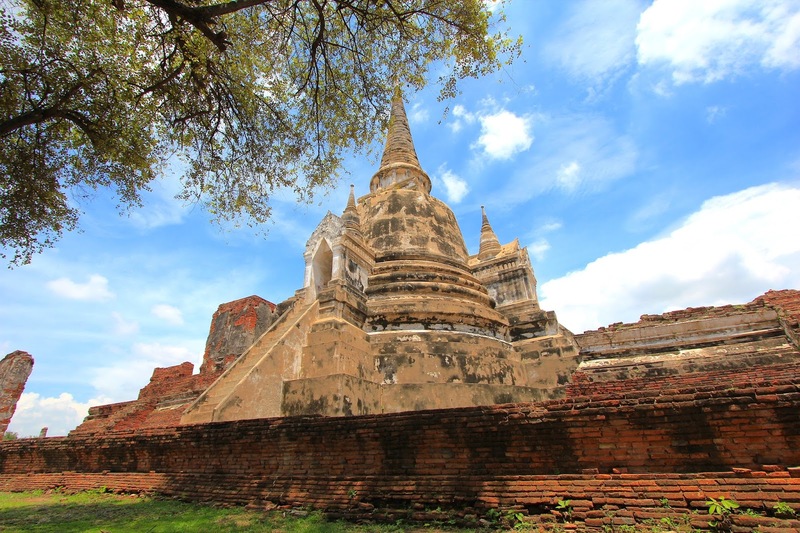 The next stop after the reclining Buddha was my favourite: majestic Wat Phra Mahathat. This of course could easily be influenced by the fact that our guide had the most information to share about it. Nearby there are stalls where you can try durian ice creams, as well as other things. In my opinion they are not the worst, nor not the best. I kind of felt like I was licking sweet onion. 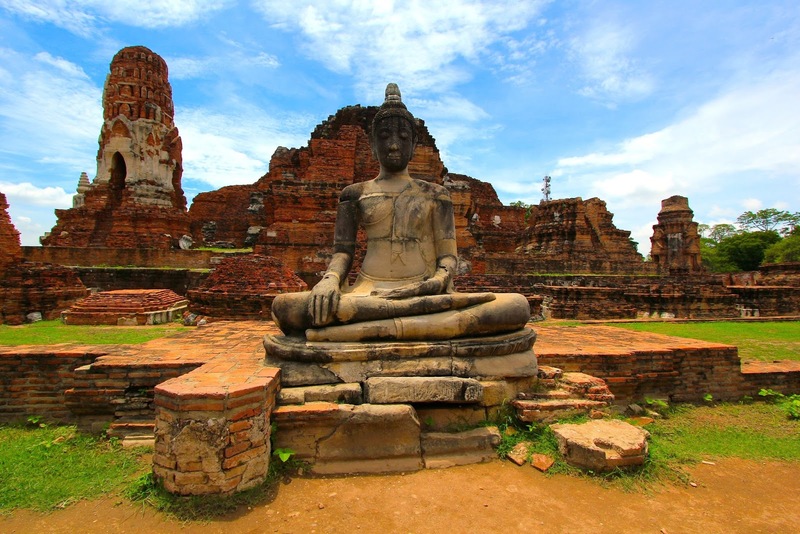 One of the iconic images from Thailand and a sacred site. There are a few theories explaining what happened and how the head of Buddha was embedded in the tree. 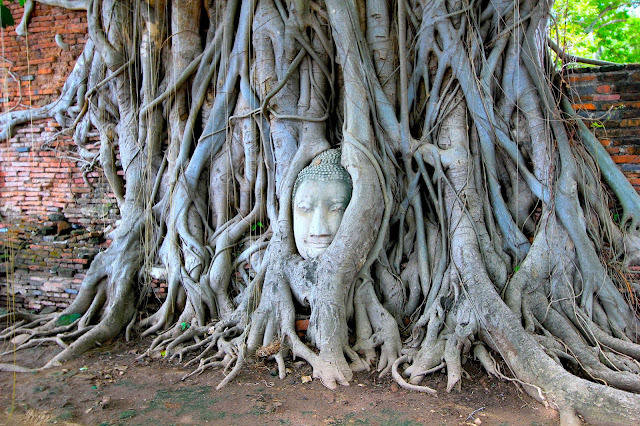 One of them is a story about a thief trying to hide Buddha's head, for they would return for it later, or being unable to carry it any further outside of the city walls. 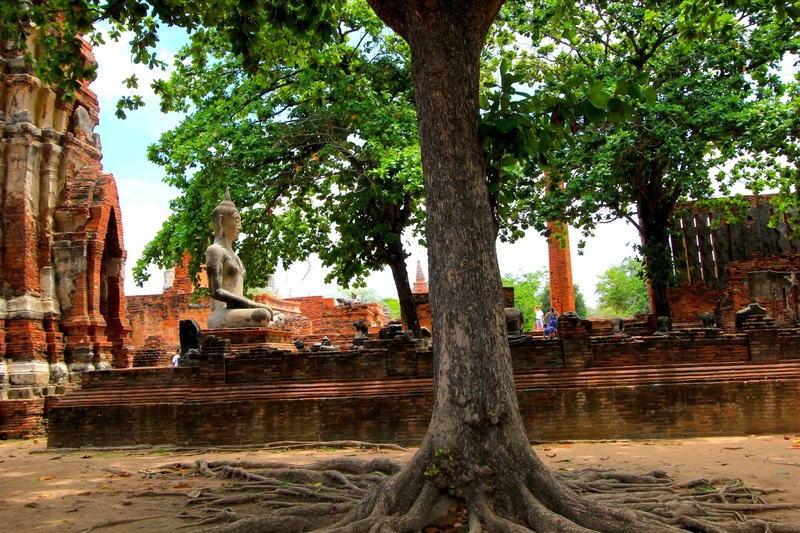 Another theory says that the tree grew around the Buddha head when the temple collapsed and will grow until Buddha looks down from above at people. I am not sure if you can climb up the stairs, but in case you were wondering what can you find there I did have a look. In most of them I noticed rubbish, and definitely a distinctive unpleasant smell. You could appreciate and wander around Wat Phra Si Sanphet the whole day long, but it does get really hot and there is not much shade to hide from the sun. Would you like to visit Ayutthaya? 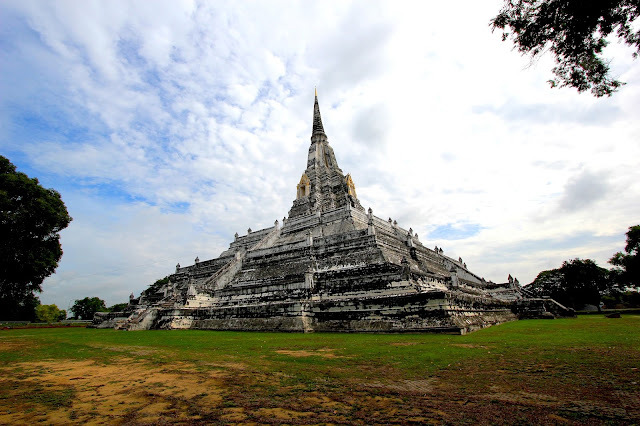 How to travel for cheaper? 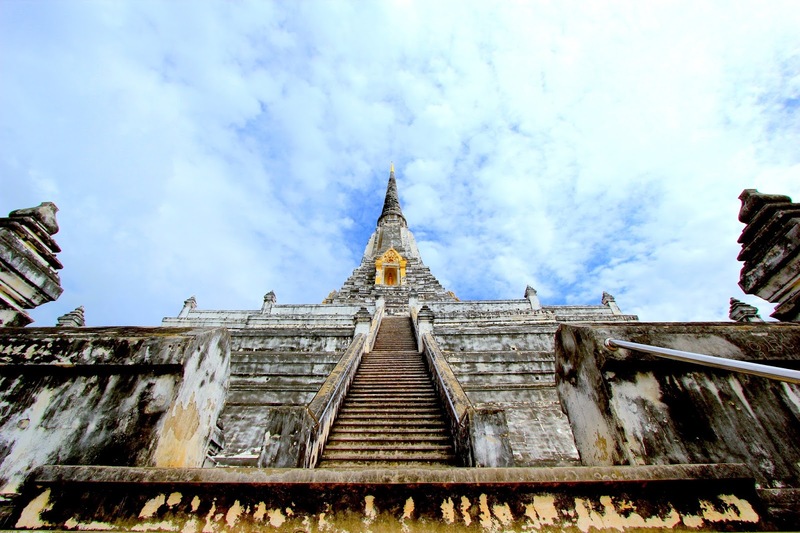 How to pick perfect destination? This looks so wonderful! 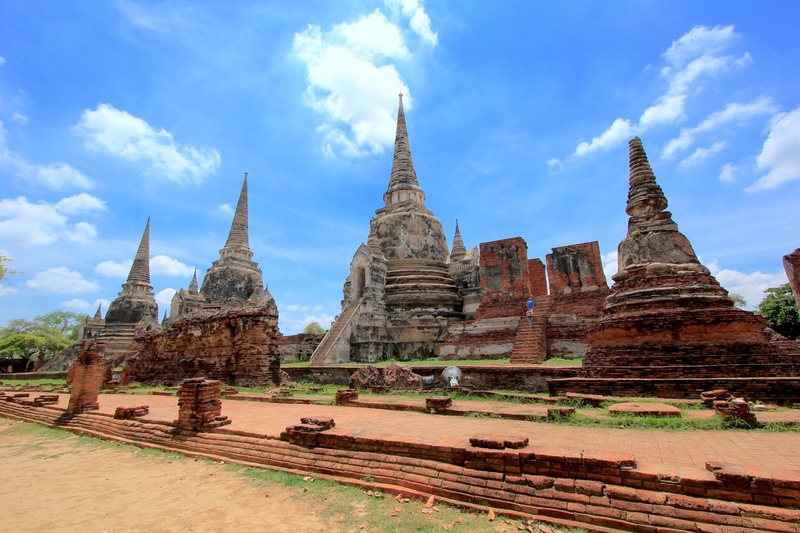 I'd really like to travel Thailand one day and visit all the different historic places there. Hahaha you possibly were enjoying Scottish summer and I cannot blame you! 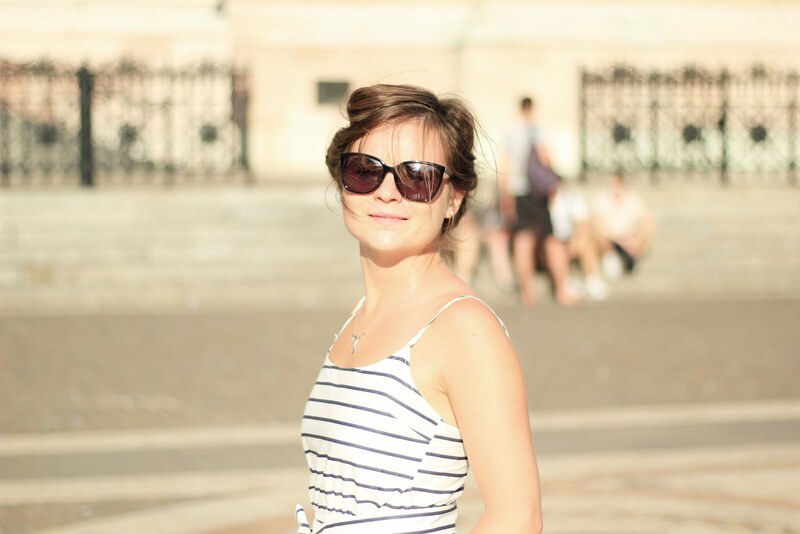 Sun was spoiling us most of the times, which was a nice change! It was fantastic! I cannot wait to go back.